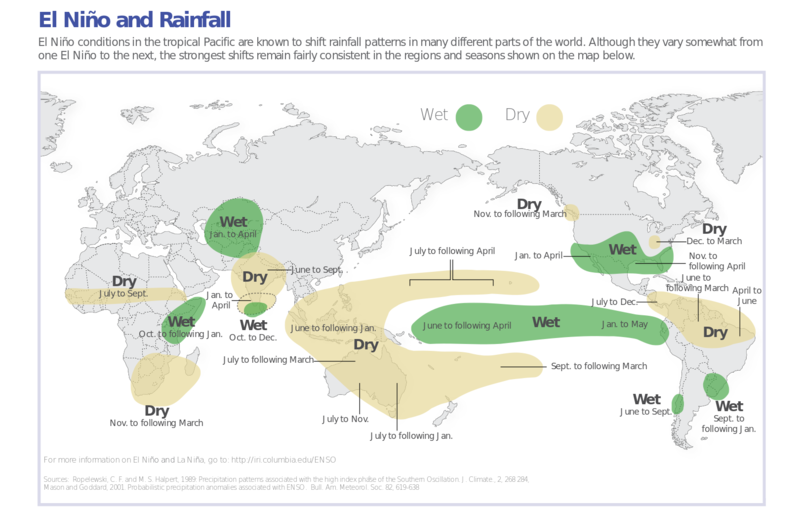 El Nino-Southern Oscillation (ENSO) or normally know as El Nino/La Nina is the natural event that occurring at the Pacific Ocean with periodical cycle of 2-10 years. They normally last 6-18 months. They are different from climate change, however, recently study found the global warming will contribute to the frequency and intensity of their occurrence as well as the impact. During the El Nino event, intense cooling at the western Pacific causing the reduce of rainfall in the western Pacific region. Sometimes, the prolong El Nino will cause serious drought at the region. One of the strong El Nino that being well recorded occurring in 1997. In a normal El Nino event, the east Malaysia will be more affected compare to the Peninsular. If the Pacific Ocean El Nino occurrence couple with the Positive Indian Ocean Dipole (El Nino in the Indian Ocean). Malaysia and the regional countries will be severely impact, causing serious lost in the social economic, as well as the ecosystem. The 1997-98 El Nino was followed by strong Positive Indian Ocean Dipole that causing severe and prolong impact on the whole region. On top of these, natural disaster, 1997 also marked the beginning of Asia Financial Crisis, as well as the pressure to organize Commonwealth Game 1998 in Kuala Lumpur. It was great challenge for Malaysia government to handle all the troubles, and great lost for its social economic growth. In 1997, it was also the first time for many public to learn the word “El Nino”. The El Nino event in 1997 also marked the increase of public awareness on the environmental issue, transboundary pollution etc. After the event, ASEAN countries start preparing the Agreement on Transboundary Haze Pollution. Only until 2014, the Indonesian government is preparing to rectify this regional agreement. Can we predict the El Nino? Yes, currently there are some climate prediction centers are closely monitored the tropical Pacific Ocean and conduct some scientific modelling study. Some of the prediction centers are able to provide El Nino prediction a few months in advance.